Heat oven to 350°F. Spray 24 mini muffin cups with cooking spray, or grease with shortening. Cut cookie dough into 24 slices. Press 1 slice in bottom and up side of each mini muffin cup, forming 1/4-inch rim above top of cup. Bake 8 to 12 minutes or until edges are deep golden brown. Cool in pans on cooling racks 5 minutes. With end of handle of wooden spoon, make 1 1/2-inch indentation in center of each cup. Meanwhile, in 2-quart saucepan, melt white chips and 3/4 cup of the peanut butter over low heat, stirring constantly. Divide mixture evenly into cookie cups (about 1 tablespoon each). Refrigerate 10 minutes. In same 2-quart saucepan, melt chocolate chips and remaining 1/2 cup peanut butter over low heat, stirring constantly. Divide chocolate mixture evenly on top of peanut butter mixture in each cup (about 1 teaspoon each). Sprinkle crushed granola bars over top of each cup. Refrigerate until set, about 1 hour. Using pointed knife, remove from muffin cups before serving. 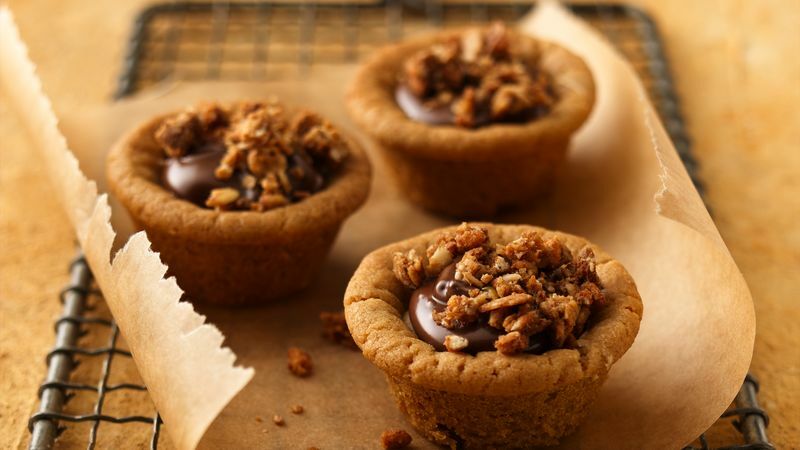 Sugar flavor of refrigerated cookie dough can be substituted for peanut butter in these yummy and versatile cookie cups.